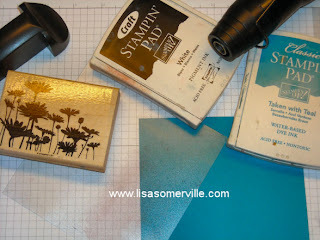 I've received a lot of questions on how I do my Faux Dry Embossing. As I've mentioned in many of my posts, the majority of techniques I showcase in my cards are techniques I've learned from The Technique Junkies Newsletter. I emailed Pat and asked if it was okay to post steps to this technique - it was shown in the April 2006 issue. If you don't have this issue - or want back copies of any of the other TJNL issues - just email Pat for pricing and mention code TJLS. 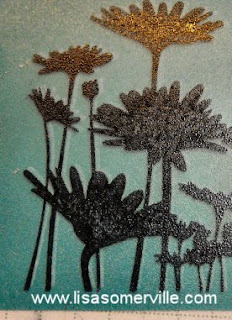 Tip - cut a piece of acetate to use as your SAMJ image sheet - that way you can keep it in the box with your stamp set. 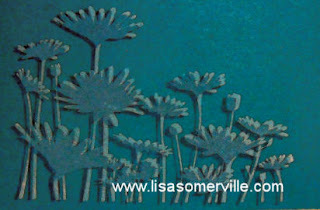 Stamp image in black ink on SAMJ image sheet - I like to use black because it's easier to see. Set image sheet aside. Clean Stamp. Stamp image in white craft on colored card stock. Heat Set. Clean stamp. Place image sheet over stamped image - move the image sheet slightly to the right and down. You'll know you have the SAMJ sheet in the right place when you see the image pop. 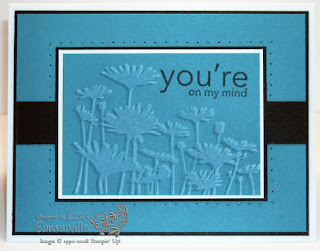 Remove image sheet, ink image with colored ink (that matches your card stock) use the SAMJ tool and stamp your image. 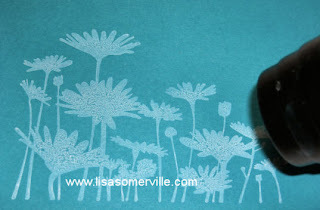 Here you can see the Teal ink stamped on top of my white images. Notice how the Teal pops around the edges. Use as desired. Hope this helps answer your questions on the Faux Dry Embossing Technique. This is gorgeous! I love your tip about leaving the acetate with the stamp set, thanks!! I have everything I need to try this marvelous technique. Thanks for such clear instructions! Lisa this is such a Fabulous tech. thanks for the reminder! Great tutorial!